Connecting the corporate world with charities through corporate social responsibility (CSR). Corporate social responsibility team building events provide real win-win solutions. Businesses are increasingly looking beyond simply putting their teams through development programmes to the achievement of greater goals and broader aims that will assist the wider community as well as boost the performance of their people. Business teams learn a great deal about themselves and their colleagues, and how they can really perform as a high performing team. 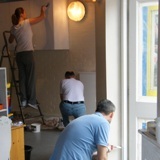 The charity for which the work is completed via this team building gain a terrific amount of invaluable help. Quest works in association with numerous charities and is able to run a broad range of team development projects both in the UK and abroad. Quest specialises in always delivering tailored team building programmes and events, and those in the Corporate Social Responsibility sector are no exception. 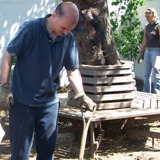 Every charity wants different types of assistance; the materials and equipment required are always unique; the Quest team required always needs specific skills, and finally the time available is always a challenge. Despite all those and many other demands Quest always delivers bespoke team building. If your team needs that level of attention, do contact us, we’d be delighted to talk. The Venture Community Association (The Venture Centre), is situated in a vibrant and diverse area of west London, and predominantly serves Golborne Ward, North Kensington. The Association strives to run an inclusive programme of activities, courses and public events that echo the varying cultures that it serves. Since it was established in 1960, The Venture Community Association has grown and now provides an increasing range of services, which reflect the needs of the surrounding community. For example the centre provides the provision of play and other facilities, to develop the physical, mental and spiritual capacities of children, young people and their families. Since 2007 Quest has worked at The Venture Centre with teams from organisations such as Boston Consulting Group, Homes England and Benson Elliot on a broad range of decoration and renovation projects. 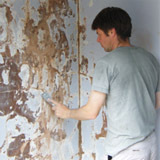 Over the years, Quest has assisted these and other corporate teams to: repair and resurface the main hall floor; landscape a garden area; redecorate the crèche, the art and craft room, community meeting room and the main hall; paint and repair outside walls; resurface the ground area around a large climbing frame; repaint the reception area; replace curtains; build storage units; complete major repairs to the famous adventure playground and replace a very worn climbing wall, amongst many other tasks. Cirencester Opportunity Group is an independent charity providing integrated education for preschool children and support for their families. It was founded in 1973 and has been providing enriching and stimulating learning experiences to generations of children for more than 40 years. 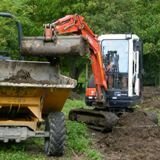 It does not receive funding from the Local Authority and depends solely on fund raising events and the goodwill of local people and businesses. Some time ago the playgroup was bequeathed a 2 acre plot of scrub land at the back of the centre. 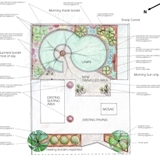 The group had ambitious plans to develop the area into a sensory forest school but a lack of funds had prevented the project from taking place for many years. Quest knew that the Landmark Information Group were looking for such a project as part of their charity challenge team building event so Quest brought the two parties together and project managed the transformation. In addition to clearing the scrub and rubbish from the site this project also involved planting over 100 trees and 50 scented plants, laying nearly 400 metres of path suitable for wheel chair access; constructing a willow dome, clearing the river, felling dangerous trees, creating a barked play area, erecting a ten metre long pergola, building seated areas from the old felled trees and putting in various nesting boxes.